In 2013, Puebla became the second-most active city in Mexico (behind Mexico City) as measured by activities organized by Wikimedia Mexico, the official Wikimedia chapter in the country. In nine months, the community has promoted three edit-a-thons in Puebla (the most recent held on August 31) and has initiated a pilot educational program at a university. Of course, Wiki Loves Monuments (WLM), the largest photo competition in the world, could not be left out of the plan. 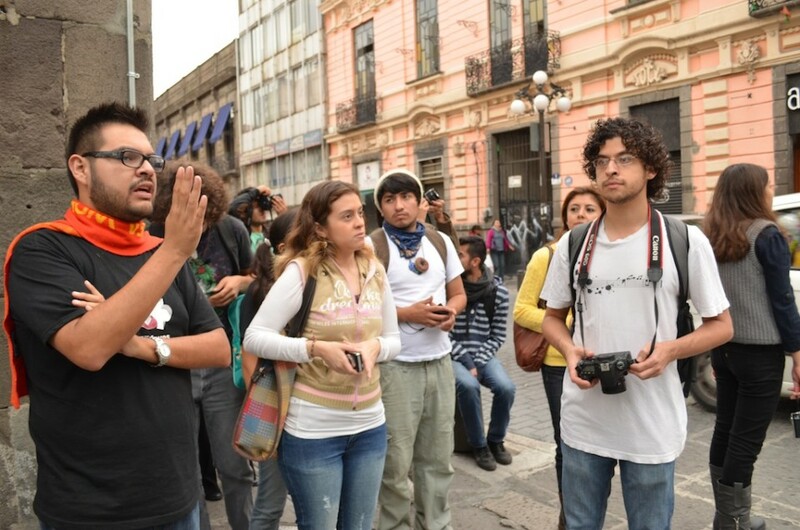 In connection with WLM, the Puebla group organized four photo walks in the Historic Downtown, considered a World Heritage Site by UNESCO since December 8, 1987. The Puebla downtown is one of the most emblematic of the colonial history of Mexico, with the Puebla Cathedral as one of its most representative monuments. In this area of ​​the city, there are many architectural styles typical of the colonial epoch–such as Mexican Baroque and neoclassical buildings–and from the 19th Century and the Mexican Revolution. The first two photo walks were held on Saturday, September 21, in the evening at 16:30 and another at night at 19:30. The night tour was made possible by a project of the city mayoralty, which this year placed lighting on different monuments in the historic center. Thus, based on these illuminated spaces, we could create a night route for photographers. The first event attracted 15 people, while the second drew another 10. Among them were students, professionals and other amateur photographers. The program consisted of two walks with twelve stops, starting in the atrium of the Cathedral of Puebla, where we spoke of the legend of its construction ​​by angels. Hence, we visited La casa del que mató al animal (“The house of the one who killed the animal”), a Gothic building with plateresque details and grotesques, which currently serves as the headquarters of a local newspaper. Another point we visited was the University District, where one finds the Edificio Carolino, used today as the headquarters of the Autonomous University of Puebla (UAP). Opposite is the Plaza de la Democracia (Democracy Plaza), where Francisco I. Madero, revolutionary and first elected president of Mexico, met with students in May of 1910 before the start of the Mexican Revolution . The route also passed through the Church of San Pedro, now a museum of art and the Church of San Cristobal, another representative of Mexican baroque building, which served as an orphanage in the nineteenth century. Later, we stopped at the Casa de los Hermanos Serdán, an important location where Máximo, Aquiles y Carmen Serdán (heroes of the Mexican Revolution) lived. Later we went to the House of Dolls, the site that now houses the University Museum of the University of Puebla. Finally, the last point was the City Hall, the current home of the city government. The City Hall is an Elizabethan style building with neoclassical and Italian Renaissance details. The photographers were able to enter to the hall of the Cabildo, where they store the Royal Decree that founded Puebla as a city in 1531. The route of Wiki Loves Monuments in Puebla was rich in history and participation. It allowed the audience to get a little closer to the architecture of the city, vast in details and anecdotes. We received positive comments on each route and some promised to go to the next photo walk. Even on the night tour, despite the light rains, the mood and interest never waned. In Puebla we enjoyed a monumental Saturday, one that will be recorded, thanks to the cameras, as part of the biggest photo contest on the planet.